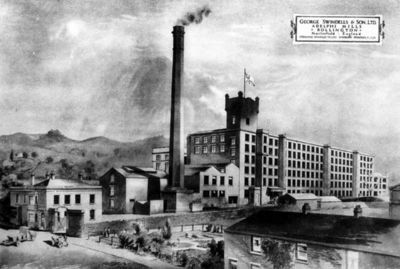 Begun in 1851 by Martin II and his brother George Swindells, the mill was named Adelphi in recognition of the Greek meaning of the word – brothers. It opened for business in 1856. George was responsible for running the mill. The location beside the Macclesfield Canal ensured that transport of raw cotton from Liverpool could be made to the door, as well as being able to conveniently despatch finished goods. Adelphi was steam powered. It was equipped with a beautiful octagonal stone chimney which was very unfortunately demolished in the 1980s when the boiler house and nearby rooms were being converted into an hotel and pub. That venture failed after a very few years but of course the chimney was gone. The base of the chimney became the entrance to the hotel and is the principle entrance to the offices today. Originally there was a gate at the entrance to the mill yard with an arch above it. This was lost in the early 20thC when road vehicles got bigger and needed more clearance. A gatehouse was also provided and that remains today. The main mill building was never extended, other than a small roofed area at the south end, so the building we see today is essentially what was originally built. In the 1920s an additional building was constructed between the mill and the railway to provide additional storage. This building still exists and is now accessed from Clough Bank, rather than the mill yard. The mill was built to spin cotton, there was no weaving. In 1898 it was amalgamated with other Bollington mills to become the Fine Spinners & Doublers Association Ltd. 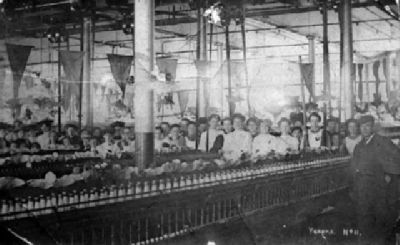 In early 1948 it was converted from cotton to become a silk-throwing and winding mill1. FSDA became part of the Courtaulds group and, for a while, processed man-made fibres at Adelphi. This was not a success and the mill closed in 1970. Today Adelphi is a hive of activity, being fully occupied by modern businesses mostly providing services to the pharmaceutical industry (one of the largest, AstraZenneca, is based nearby), and IT users. It was unfortunate that the mill was on the towpath side. The canal had been designed and built with the towpath on the opposite side from all the intended wharves. This had a number of advantages which would be lost to both Adelphi mill and other canal users – keeping the towpath away from the wharf avoided having towing horses coming through the work area; it avoided the need for towing lines to be carried over the top of moored boats; it prevented passing horsemen and the boaters from pilfering. My thanks go to those who researched and discovered the history that is presented in these pages. Please read the full acknowledgement of their remarkable achievement. Please don’t chuck out those historic documents and pictures! Find out why here.